thus not taking any rent nor investment inquiries here . but as Korea has begun to lead many aspects on Earth over the Millennium new rules are forming . thus the law puts vital importance on citizen rights to reside in contracted property . resulting in similar rent price throughout populated areas, aside from prime hubs and the most remote . a student is here to learn, visitor is here to shop and a worker is granted similar rights to live . and what makes the difference in the eyes of the law is that number in your alien registration card applied through your school or company . before you sign a contract you should make sure who owns the property which is public record . a few groups from india have started to sublet apartments siting they are bilingual . although it may seem like the easy way : do not let language get in your way . hire a translator or go through a real estate agency . when things go wrong on sublet : you will have nothing to hold on to . a reputable landlord to foreigners will even have a translation of the contract notarized . the two most common legal form in South Korea are your personal history and leasing contract and found in larger stationary stores such as Kyobo BookStore and Alpha Stationaries both translated as “MoonGo”. non-existent on budget one-rooms but necessary on pricey apartment lease are contract fees initially paid to hold space after which both parties agree on actual move-in date . finally, three parties will sign at bottom each taking a copy if real estate agency is involved . while we mention legal issues here : there are quite a number of North Americans teaching with fake degrees taking advantage of recent Korean mandate : you can teach English as long as you have any sort of college degree period . first the moral side : because Korea is a mass populace with monotone culture, parents put such importance on education which is the only way out onto welfare . those already well-off have already sent their kids abroad so the school and institutes hiring foreigners or returning Korean Gyopos are medium-income at most . so know you are taking hard-earned money . only to keep it for a rainy day, when you will have to suddenly take the next flight-out giving-up unpaid salaries and apartment deposits . many old inns offer cheap long-term lodging with newer competition from motels and residences . although still hidden in rear alleys and not kept clean it may be an attractive alternative price-wise especially if you find one near where you study or work . motels are originally love-motels rightfully concentrated in naughty – but not dangerous at all like in neighboring Japan – areas of a city rented by say, 3 or 4 hours mostly coming with an internet-connected computer intact as the latest boasting sauna-showers and jacuzy-tubs . still some in out-of-way areas will offer long-term lodging and you won’t have to buy a computer . Residence is a new phenomon over the Millennium Korea with clean and modern boutique-like hotels but without the extra facilities traditional hotels offer such as lounge, coffee shop, restaurant, health gym nor swimming pool . and because of this most room come with kitchenette but only a shower without bath tub . hotels are regulated by law and designated stars fitting their current service and facility . only choice for a single in far-away lands were to live in a room of a household but remote migration for college and preparation-of gave birth to one-rooms over the Millennium and now small buildings after buildings of one-rooms near campuses almost like endless higher apartment complexes in satellite cities around the Capital of Seoul . one-rooms are your Korean single studios with kitchenette intact and separate toilet-bathroom-shower . most share laundry machine at basement or roof-top . if you are a teacher your school might have lodging designated . but if they take away a good part of your salary for this you might want to make your own choice . one-rooms require a small deposit than family apartments and rented by the year and some around popular foreign residential areas even rent Seasonally . one-rooms mostly come furnished literally called in Korea as “option” with bed, closet, drawer chest, TV . and because South Korea enjoys distinct weather of four Seasons, all one-rooms come with air conditioner and heating of which ondol floor-heating via midnight electricity is popular because it is easy to install – a metal plate heating cheaper power during the wee hours to retain heat throughout the day ! although Korea is now getting more advanced than neighboring Japan, one aspect that has divided paths before the Millennium were electric bidets in public toilets as well as hotels in Japan . and rightfully so, because they should study .. a desk is all that is implemented in basic model with perhaps a narrow bed . all else, including toilet and shower is shared . 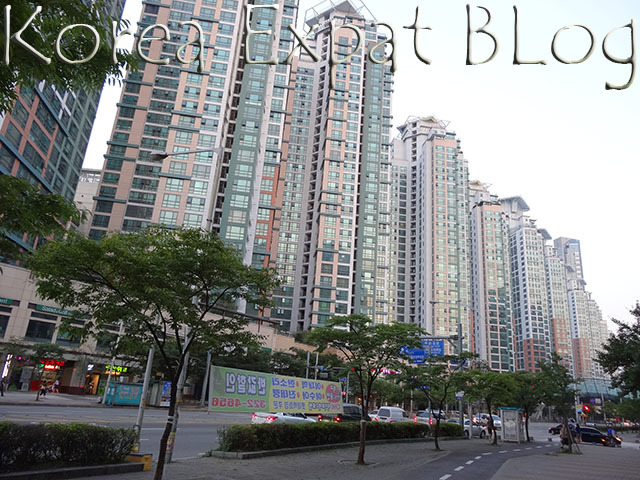 first : most apartment for lease come unfurnished except for foreigners in HanNamDong for Westerners, DongBuiChonDong for Japanese or BanPo for the French in Seoul and HaeUnDae in the Port City of Busan or Pusan . second : you have the choice of either monthly rent, with down-payment or lease, advance-depositing a bulk of actual property value . because of lesser money involved it is common practice to seek one-rooms directly on local papers left on bus stands . still we suggest you go through real estate agencies which also advertise in these papers because although you have to pay them almost half a month’s rent, they will mediate if something goes wrong during the term of the contract . real estate agencies normally get paid from both parties and are limited by law to require 0.3 ~ 0.9% charge depending upon rent, lease or sales and actual amount involved but is more set by the payer which may be much lower or higher depending upon the situation – more so because real estate agencies follow the old Korean tradition of being the gathering place of the neighborhood attracting returning customers . Korea is a small penninsula with limite resources so mandatory recycling went into effect early-on as the nation developed . the regional office separated by “Ku” governs this process, subcontracting local companies to retract certain items on certain days of the Week . where to leave each of the above is designated by area or building so ask your neighbor . however some parts with substantial foreign residence seem to collect any mix of the above daily .